The tax season is here and I have started getting mails and comments asking for the “Best Tax Saving Investments”. Unfortunately there is no straight answer to this. The best investment is different for different people and is aligned with their return expectations, risk taking ability, personal circumstances, and alignment with their financial goals among other things. You can claim maximum deduction of Rs 1.5 Lakhs u/s 80C (including Sections 80CCC, 80CCD) by investing in eligible instruments. Unfortunately investments and expenditures allowed u/s 80C is too crowded and that makes the choice difficult for most people. The post below suggests the approach to select the investments for tax planning. The expenses on tuition fees for full time courses for maximum of two children is eligible for deduction u/s 80C. However, the deduction is not available for tuition fee to coaching classes or private tuitions. The following expenses are not considered as tuition fees – Development Fee, Transport charges, hostel charges, Mess charges, library fees, Late fines, etc. Stamp duty and registration charges up to Rs 1.5 Lakh can be claimed for deduction u/s 80C. The payment should have been made in the same financial year for which the tax is being paid. i.e. the deduction cannot be carried forward to next year. Also the house should be in the name of assessee claiming deduction. In case you have paid stamp duty for new home, you most probably would exhaust your 80C limit for the year and no further investment might be required. EPF is a compulsory deduction for most salaried employees. The deduction can be 12% of the basic salary & dearness allowance or Rs 1,800 every month. Look at your salary statement to know how much have you contributed for the year. Count only your contribution. Employer’s contribution is not eligible for tax saving investment. You can also have some amount contributed through Voluntary Provident Fund (VPF), which can be up to 100% of the basic salary & DA. Also Read: VPF – A Good Retirement Option! NPS (Tier 1) is compulsory for most Government employees who joined after 2004. Look at your salary slip to check your deduction. Again only your contribution is valid deduction. Employer’s contribution is not eligible. The good thing is you can use this contribution to claim additional tax deduction up to Rs 50,000 under the newly introduced Section 80CCD(1B). We have explained this at the last paragraph of the post. There are some deductions which happen year on year like home loan repayment, insurance premium etc. Are you paying home loan? The principal component paid every year is eligible as tax deduction. For this you can download the tax statement from banks’ website. In case not get it from the loan provider. This would give you an estimate of principal and interest paid for the financial year. Have you bought life insurance products like ULIP, Endowment Plan or Term Insurance where you need to pay the premium for subsequent years? If you want to continue investing in the same you can continue to claim tax benefit. If you have PPF account you should contribute minimum Rs 500 in a financial year. In case you don’t do, a fine is levied. Minimum deposit of Rs 1,000 needs to be made every year else penalty of Rs 50 is levied. Do you have NPS account? A minimum contribution of Rs 1,000 is required every financial year to keep the account active. Do you have dependents? Would they survive financially in case something happens to you? Do you have enough life insurance? If no go get a term insurance first. It’s important to opt for protection first. Online term plans are much cheaper than offline. So it makes sense to go for online plans. Do not provide false information in the insurance form. The insurance claim can be rejected for wrong information. Do not buy anything other than Term Plans from insurance companies. No money back, endowment plans! Popularly known as Tax saving Mutual Fund. These are equity based mutual funds and one of the best investment options to create wealth in the long run while saving tax. In case you can digest the volatility of stock market, this is the recommended option. 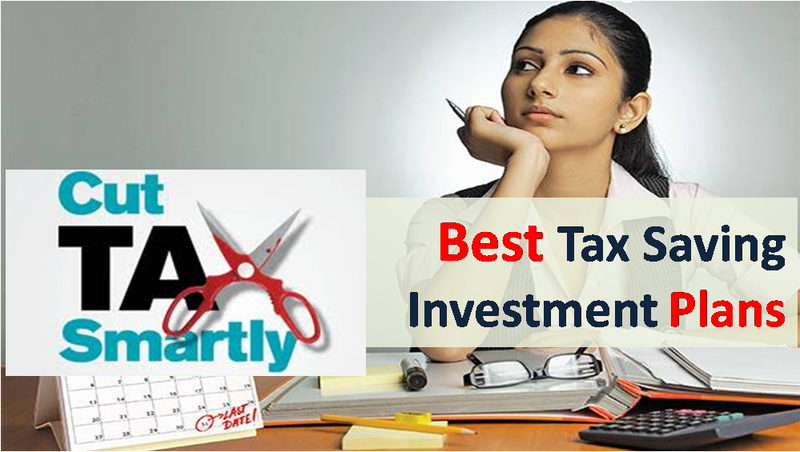 Among the tax saving investments, ELSS has least lock-in period of 3 years. The gains on ELSS Fund is Tax Free. Convenient to buy and manage as ELSS can be bought and redeemed online. There can be considerable volatility in returns and you can get negative returns at the end of 3 years. Invest through SIP (Systematic Investment Plan). This helps in tiding over volatility to some extent. Choose “Growth” option over “Dividend Payout” as this creates wealth in the long run. If doing lump-sum check for stock market valuations. If you invest at high valuations, you might see very low or negative returns at the end of 3 years. Avoid “closed-ended” ELSS NFOs which are launched at this time of the year. PPF is another popular tax saving investment option for 80C, especially for people without any other provident fund. The lock-in is for 15 years but there is partial liquidity from 7th year on wards. You can use combination of PPF and ELSS for tax saving investments. In case you find stock market over-valued, PPF is good option. SCSS is good option for senior citizens (above 60 years of age) as it gives regular quarterly interest income directly in bank account. The interest received is taxable. TDS would be deducted if the total interest in a year is over Rs 10,000. However, if eligible Form 15H can be submitted to avoid TDS. SCSS account can be closed after 1 Year (with penalty) but in case you have availed Sec 80C benefit, it would be reversed. The joint account can be opened only with your spouse. There is no age limit applicable for the joint account holder. SSA can be opened by parents of girl child subject to certain conditions. SSA can be a good option for fixed income investment for child. However you should also invest in ELSS or other equity mutual funds for goals related to child. NSC can be bought at post offices to save tax u/s 80c. It is available for 5 years (NSC VIII) only. The interest offered is 7.8%. The interest is higher than most tax saving bank fixed deposits. You need to visit Post office for buying and redeeming NSC units. This can be a hassle for people who shift addresses frequently. India loves fixed deposits and FD which saves tax is obviously very popular. Be cautious of small co-operative banks as they have higher risk than bigger private and public sector banks. The above funds are hybrid or balanced mutual funds – the first two funds are debt oriented mutual fund while the one from Reliance has two funds – one debt oriented and other equity oriented. Reliance Mutual Fund Pension Plan is better option among the three funds as you use Wealth option (which is equity oriented fund) to create the corpus and then switch to Income option (which is debt oriented fund) for regular income after retirement. Some of you might have to contribute compulsorily to NPS. In this case you can take deduction up to Rs 50,000 under the newly introduced Section 80CCD(1B). And then you can choose more efficient investment for 80C. However for people who do not have NPS account, it might NOT make sense to open one just for newer introduced tax benefit u/s 80CCD(1B). You would do better to pay tax and invest the remaining amount in good equity mutual fund. 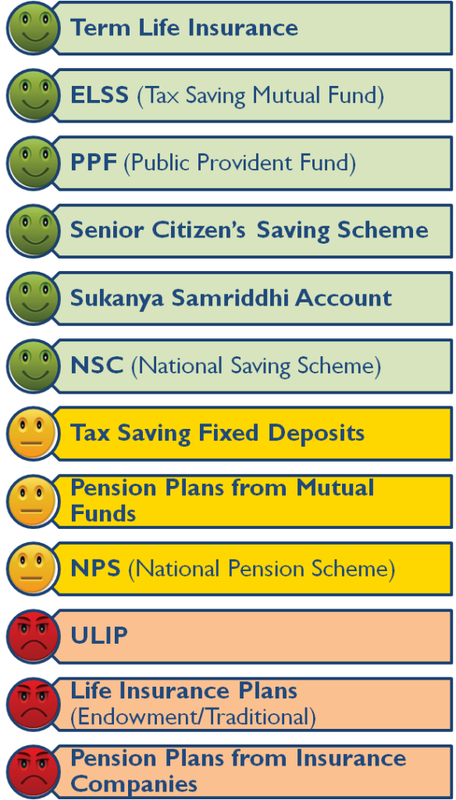 With New taxation for NPS on maturity you can invest in NPS to take tax benefit u/s 80CCD(1B). We redid our calculations which you can check in hte link below. Why you should not invest in NPS? The investment is locked-in till the time of retirement of till the subscriber turns 60. If you close the account mid-way only 20% is offered lump-sum and buy compulsory annuity for rest 80%. So in case of early retirement, this money is not going to work for you. On maturity at least 40% of amount needs to buy annuity which offers low returns and is taxable. Below are some investments that I would recommend to stay away as they have poor returns and/or can hold you in complicated tax tangles. Also you would hear multiple horror stories on how these investments were miss-sold and people are now struck. Unit Linked Pension Plans (ULPP) is offered by insurance companies as a investment to take care of your retirement. The broader product structure is, you invest in the product for first few years and then the insurance company pays you some lump-sum amount and then a regular annuity after certain period. Why you should not invest in ULPP? These are long term products and you would need to pay premium for a long period of time. The returns on ULPP are miserable. If you want to surrender these, you loose a lot in terms of returns. The tax benefit claimed is reversed if the plan is surrendered mid-way. Only one third of amount at maturity/surrender can be taken as lump-sum. Two third amount has to be necessarily used for buying annuity. ULIP and endowment plans are other investment which is miss-sold very often. People do not understand the complex product and later suffer heavily. Also Read: Not all Life Insurance/ULIPs Offer Tax Benefit? Why you should not invest in ULIPs? In case you want to discontinue your investment, the surrender value is pathetic. As said earlier the best tax saving investment is different for different people and is aligned with their return expectations, risk taking ability, personal circumstances, and alignment with their financial goals among other things. So you must choose product that suits your above requirement. Also the ranking done by me may not suit you but you would do good to stay away from ULIPs, Endowment Plans and Pension Plans (ULPP). Go ahead and save tax! Sir kindly provide some best Term Plans for me. My age- 34 DOB- 08-11-1983. Thank you..
Say my grandfather is no more and there are numerous investmentin joint name like nsc fd kvp and others..now they are maturing in the year 2018-2019..so is the income received on maturity taxable in the name of other joint holder or they will be normaly shown in balance sheet and my capital figure will increase..
ELSS schemes are the best for people who prefer lower lock-in periods and higher tax free returns. 1. Can I claim HRA by paying rent to parents for residing with them in their another old house? How much amount can I claim for tex deduction on HRA? 2. Parents took home but took loan in my name and fully paid my me. Is that home will be consider as my 1st house as loan in my name? 1. Yes you can pay rent to your parents as per market rate of similar house and claim HRA tax benefit. There is no limit on how much rent you can pay. But remember this rental income will be added to your parents income (whoever is the owner of the house) and taxed accordingly. 2. If the house is not in your name then you do not own the house even if you paid the loan. So this is not your first home. 3. The new house you bought is your first home and you can claim tax benefit as such.